“Gaze,” known as Dear born’s resident mustang, remains standing majestically at the Ford Community & Performing Arts Center thanks to encouragement from the community, and a major donation from Kenwal Steel and residents David and Cherie Bazzy, and the efforts of the Dearborn Community Fund. Deemed a favorite public sculpture by many who saw it at The Center, “Gaze” by sculptor James Oleson first came to Dearborn in 2012 as one of 12 sculptures on temporary exhibit through the city’s Art in Public Places– Midwest Sculpture Initiative. The project is funded by the Dearborn Community Fund with support from the East and West Dearborn Downtown Development Authorities. A ceremony was held in October 2016 to thank the donors who purchased the sculpture for permanent public enjoyment in Dearborn. With Dearborn’s majestic iron horse standing sentry in the background, Mayor John B. O’Reilly, Jr. and Dearborn Community Fund Chairwoman Susan Rowe thanked the donors who made it possible to keep the popular sculpture in the city where it has become one of the most popular pieces of local public art. The DCF had just two weeks in early 2014 in which to pony up the $16,000 to purchase “Gaze” to ensure the horse would stay in Dearborn. The city o f Hastings had offered to buy the metal sculpture from the artist, James Oleson, Jr. It looked like “Gaze,” made of recycled and found objects, would be moving to the mid-Michigan city, until the leadership of Dearborn-based Kenwal Steel Corp. stepped up. Mayor Jack O’Reilly said it’s appropriate that “Gaze” stays in Dearborn, home of Ford Motor Co. and its iconic Mustang, which was manufactured at the for mer Dearborn Assembly Plant for decades. 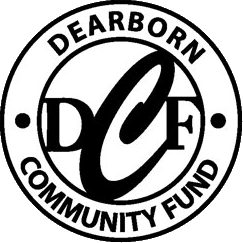 The mission of the nonprofit 501c3 Dearborn Community Fund is to support cultural and recreational programs and projects to enhance the quality of life in Dearborn. Donations towards DCF projects are tax deductible to the full extent permitted under law. For more information, contact the DCF office at 313-943-5478 or send an email to: dearborncommunityfund@ci.dearborn.mi.us.